FFWPU Australia, September 17-18, 2015: Yeon Ah Nim and her entourage arrived in Sydney, Australia on 17 September. They were warmly welcome by the local members at the Oceania Peace Embassy. Yeon Ah Nim met with the youth and spent the next four hours listening and encouraging them. She had created such a closeness and personal relaxed feeling during that short time. In the evening, blessed wives and youth had dinner with Yeon Ah Nim. 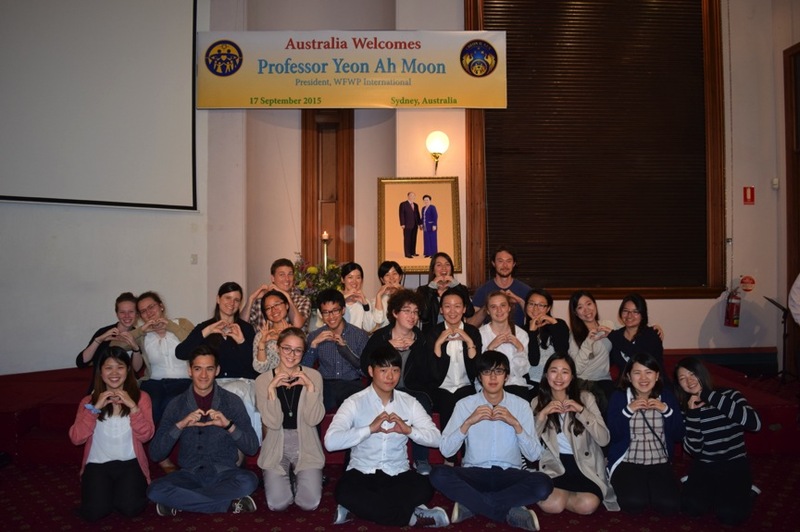 After the dinner, we had a wonderful three hours meeting with Yeon Ah Nim, attended by over 80 Sydney members in the Peace Embassy. She began by helping us to relax, saying we can move around and make a drink. Questions were quick to follow, such as the different courses of faith between the first and second generations, meaning of tribal messiah, and the age of women. Yeon Ah Nim stressed that there is a big difference of purity of heart between first and second gen, but that the first gen had been trained and had deep relationship with the True Parents. However, second gen can be nurtured and trained. Then, their pure heart will shine. She expressed hope and trust to the second gen. She also emphasized the importance of doing HDH even for a few minutes as a family as this puts Heavenly Parent first in our life. She brought a message from True Mother to our community, that we work together to fulfill Heavenly Tribal Messiahship. She explained the significance of tribal messiah and how we can achieve it. After this session, blessed families had the opportunity to have a photo session with her and again experienced a closeness and warmth that can only be described as from “True Mother’s Love.” She was a fantastic example of this motherly love accepting and embracing everyone and raising them up with her sensitive and caring Q & A sessions. We thank Heavenly Parent and True Parents for sending Yeon Ah Nim to support and launch the Global Women’s Peace Network in Australia. Finally, she also brought gifts and seed monies to support the members and youth. In return, the community presented gifts of appreciation to her and her staff. We left the gathering with gratitude and truly great memories. True Parents visited the McDonald’s across from the Oceania Peace Embassy for a meal back on 7 December 2005 when they visited Sydney, Australia for the Inauguration of UPF Tour. Hearing this fact, Yeon Ah Nim decided to take members to the McDonald’s. She said to us that the meal was a treat from Hyo Jin Nim, her husband who ascended in 2008. She took time to take order for members, making sure each member have their specific order taken. After that, she brought the foods and served them. Members were moved by her sincere heart and care. On Dec 7, 2005, True Parents looked from this window at the Oceania Peace Embassy.